Comm Eye Health Vol. 20 No. 64 2007 pp 70. Published online 01 December 2007. Clinical Director, Ol Malo Eye Project, Kenya; Specialist Registrar, Royal Victoria Infirmary, Newcastle-upon-Tyne, UK. Founder, Ol Malo Trust, PO Box 1195, Village Market, 00621, Nairobi, Kenya. There is a global commitment to eliminate trachoma by 2020.1 Many different governmental and non-governmental agencies, in conjunction with industry, are working hard to achieve this aim. It relies on implementing the whole SAFE strategy: surgical treatment for trichiasis (S), widespread distribution of antibiotics (A), face-washing with other hygiene measures (F), and environmental improvement (E). they are difficult to build in a semi-arid climate where mechanical digging tools are not readily available. There may be additional concerns with the use of latrines. Experience with the Samburu tribe in Kenya has shown that both women and men are very private about their toilet habits. They would therefore never use a latrine, as it would make their intentions obvious to any observer. The Samburu in general, and especially the children, are also frightened of dark holes because of the possibility that they may harbour potentially lethal snakes. Unfortunately, latrines are little more than dark holes in the ground. Consequently, latrines that are installed by well-meaning organisations are often left untouched. Latrines used as rubbish pits can also pose a danger to children. The Ol Malo Eye Project, with the Ol Malo Trust, has been working on the elimination of trachoma from the Samburu tribe since 2003, with surgical camps, antibiotic distribution, and education. We were also successful at improving face-washing. However, we were uncertain about how to change the tribe’s toilet habits, as the project was working with the Samburu at their invitation and within their cultural boundaries. The option chosen was to teach the tribe members to cover their faeces. To help put this idea into practice, we employed the local spear-maker to make a small trowel designed by Julia Francombe of the Ol Malo Trust. 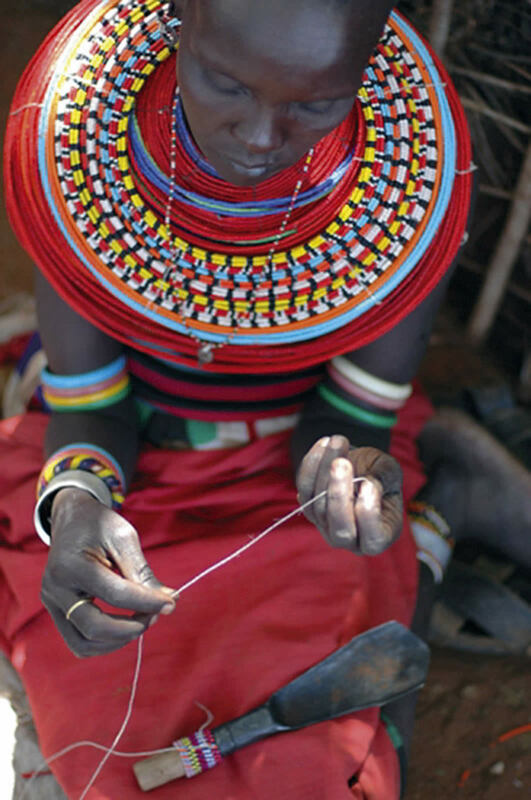 Samburu women were then paid to decorate the trowels with beads to make them more attractive to their owners and to identify different groups: unmarried girls, married women and their children, circumcised men, and elders. These trowels can be concealed inside the clothing so that the women’s intentions are not obvious. 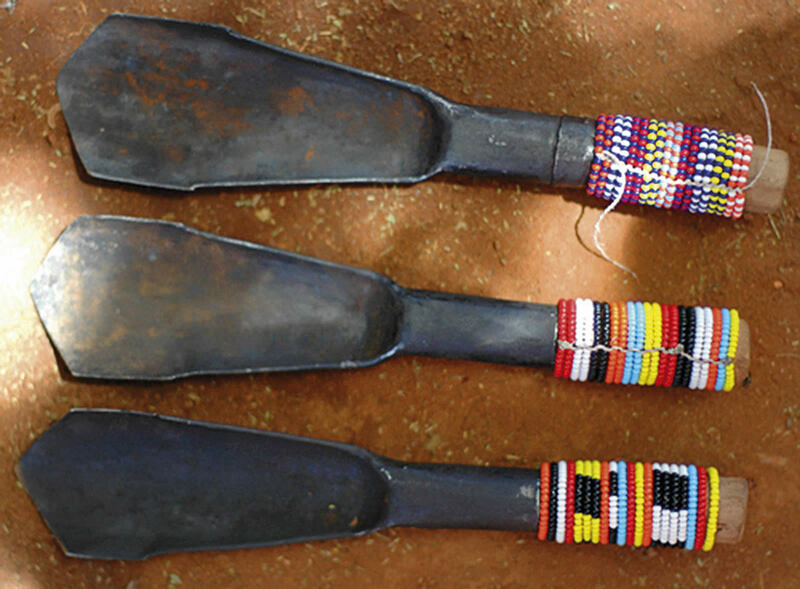 We called these trowels ‘ngisipet’, which literally means ‘to cover up’ in Samburu. They have been remarkably successful and are now fully incorporated into Samburu culture, so much so that the warriors and elders now wear them alongside their other decorations. The beading around the trowel now signifies the status of that person within the tribe. The trowels are distributed by local trachoma monitors who give advice on how to use them and on other aspects of preventing trachoma. The success of the ngisipet is due in large part to the fact that the Ol Malo Trust works within the Samburu tribal structure, liaising closely with the women and the elders. Any idea, such as the ngisipet, is discussed in detail with the tribe, created in conjunction with the women, and then taken before a committee of elders for their approval. They consult the wider group of elders and then return to the Ol Malo Trust with their decision. This approach should be encouraged for any organisation hoping to successfully work with a tribal culture. If the aims of VISION 2020 are to be met, it is vital that cultural interests and taboos are acknowledged when the SAFE strategy is being implemented. It is important to stress that the ngisipet should only be offered to nomadic people; some Samburu have settled permanently close to towns and their children attend schools. In this situation, when there has been a shift in culture, the use of fixed latrines can be encouraged. However, the ngisipet may be of use to other sub-Saharan nomadic tribes. 1 World Health Organization. Global elimination of blinding trachoma WHO/EB101.R5 Geneva, World Health Organization, 1998. 2 Emerson PM, Bailey RL, Mahdi OS, et al. Transmission ecology of the fly Musca sorbens, a putative vector of trachoma. Trans R Soc Trop Med Hyg 2000;94:28–32. 3 Mariotti SP, Pruss A. The SAFE strategy. Preventing trachoma. A guide for environmental sanitation and improved hygiene. WHO/PBD/GET/00.7/Rev.1, 2000. Geneva, World Health Organization.